It's a law thousands of people break each day and it's putting children's safety at risk. News 8's Marcella Lee rides along with a school bus driver and shows us the danger on our San Diego roads. The rollover crash happened on northbound I-5 near the Loma Santa Fe exit, blocking two lanes of traffic. NBC 7's First Alert Traffic Anchor Whitney Southwick has details. Three people were injured in a crash early Saturday morning in Sorrento Valley that may have been caused by alcohol impairment, police said. The crash happened around 4 a.m. at the intersection of Mira Mesa Boulevard and Camino Santa Fe, San Diego Police Sgt. A man was killed when his pickup truck struck the side of a car and overturned several times at an intersection in the Bay Ho neighborhood, San Diego police said. The collision happened shortly before 11:15 p.m. Monday at the intersection of Clairemont Drive and Balboa Avenue, San Diego police Officer Robert Heims said. A pedestrian suffered major injuries Monday when she was struck by a car while crossing a street in the El Cerrito area, police said. It happened at about 6:15 a.m. in the 5700 block of El Cajon Boulevard, San Diego police Officer Robert Heims said. A 67-year-old woman was hit by a car and suffered what San Diego police said were life-threatening injuries as she crossed El Cajon Boulevard in the El Cerrito neighborhood early Monday. The woman was hit as she was crossing southbound across El Cajon Boulevard near El Cerrito Drive outside of a crosswalk around 6:15 a.m., San Diego police said. “ Island Press has granted Streetsblog the exclusive right to publish a series of excerpts from Jeff Speck’s new book, Walkable City Rules . These will be shared over the next several months in conjunction with the book’s October release. ” RULE 71: When repaving a two-lane, two-way street in an area where pedestrians are present, do not include a centerline without a site-specific justification. Tamandra is scared to wheel around her Normal Heights neighborhood now after a driver slammed into her this past summer. She says the person who hit her only had bare-minimum insurance and now she is stuck with an injury that makes it almost impossible to get into her car to take care of the basics. A 37-year-old man riding a bicycle was hit by a vehicle, seriously injured, and the driver sped off, officials said Sunday. Around 7:30 p.m. Saturday, San Diego officers were called to the 47th Street, just south of the 94 Freeway. Fewer Americans are biking to work, new data shows, but the bigger question is why some cities are seeing so much more progress than others. Electric scooters, app-based bike rentals and other new transportation options flooding San Diego are prompting city officials to form a new Mobility Board focused on safety, compatibility and re-thinking road and sidewalk designs. The board would unify separate committees focused on bicycle lanes and management of parking spots. NBC 7's Ashley Matthews has the latest details on a deadly collision involving a pedestrian and an SDPD patrol car. Car Strikes Pedestrian on Carlsbad Blvd. CA: Are Dockless Bikes on Their Way Out as Electric Scooters Surge? Aug. 20--The barrage of candy-colored rental bikes that appeared seemingly overnight in downtown San Diego this spring has faded in recent months. The orange, yellow and green bicycles that seemed to clog every street corner have largely been replaced by a wave of electric scooters, from the city's urban core to Mission Hills to North Park to Pacific Beach . A man in his 20s was killed early Friday morning when he was run over by a car entering a parking garage in the Hillcrest area, police said. It happened shortly after 4:15 a.m. at an underground parking facility in the 1200 block of Cleveland Avenue, located near The Hub Hillcrest Market, San Diego police officer Steve Bourasa said. The 52-year-old female was located in the north alley of 1600 Garnet Avenue, according to police. Her injuries were consistent with being hit by a car. A pedestrian was struck by a vehicle and killed on a South Bay road Monday morning, forcing the closure of a stretch of road leading to Interstate 805. San Diego police said they received a report of a crash at Del Sol Boulevard and Dennery Road involving a pedestrian and vehicle at about 7:10 a.m. No other details on the collision were immediately provided. Authorities today identified a 53-year-old bicyclist who was struck and killed on state Route 163 in the Kearny Mesa area. Dispatchers received reports shortly before 5:15 a.m. Tuesday of a man lying in traffic lanes on southbound SR 163 near state Route 52, California Highway Patrol Officer Tommy Doerr said. The crash occurred at 8:50 p.m. in the southbound lanes of the 1400 block of East Vista Way, San Diego County sheriff's Lt. Robert Smith said. A hit-and-run driver plowed through a barricade at the Hillcrest Pride festival Saturday night, hit a pregnant woman, then led police on a pursuit into La Mesa . It appeared that he ditched his car and slipped into the neighborhood near La Mesa Arts Academy on Junior High Drive. Note: GJEL Accident Attorneys regularly sponsors coverage on Streetsblog San Francisco and Streetsblog California. Unless noted in the story, GJEL Accident Attorneys is not consulted for the content or editorial direction of the sponsored content. Aaron Paff, the motorist who ran down four cyclists on October 9 of last year before fleeing the scene, was sentenced to 18 months in prison last week. A woman who suffered a shattered pelvis in a Segway crash on a La Jolla street three years ago will receive $1.7 million from San Diego under the terms of a negotiated settlement. The settlement, which the City Council is scheduled to approve on Tuesday, includes $1.5 million for Regina Capobianco and $200,000 for her husband, Christopher Capobianco, because her injuries damaged their marriage. It's been a while since we posted anything under the "Foto Friday" category, but some of you miss it so hopefully this will be back in regular rotation again. From the People for Bikes blog, good news about the Calgary bike lane network - which isn't too dissimilar from what's being proposed as part of the Downtown Mobility Plan here in San Diego. 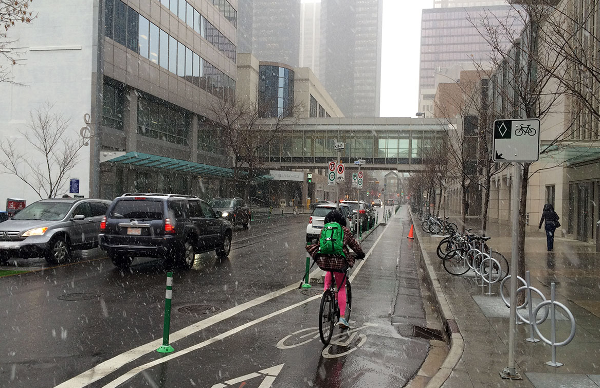 The city of Calgary, "piloted a connected downtown network of low-stress bike routes all at once." the results have been large and almost immediate. Weekday bike counts on the affected corridors soared 95 percent in September 2015, three months after the network opened, compared to the year before. The proportion of those riders who were female jumped from 20 percent to 27 percent, and younger people are reportedly riding downtown more, too. 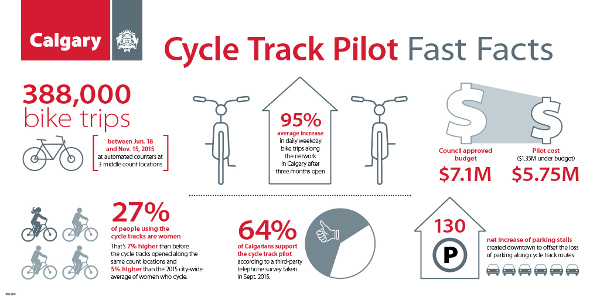 They say, women are an indicator species for a bicycle friendly city and so Calgary seems to be moving along to becoming a bicycle friendly city. Despite a very close city council vote to create the network, once the public saw it in action, 64 percent decided they approve. And on this cold and somewhat rainy day here in San Diego, perhaps we can appreciate the woman in the photo above riding on Calgary's (still new) protected bike lane network and imagine how neat it would be if we could get that here too. 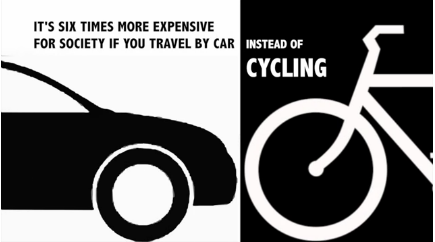 The cost of driving a vehicle is six times higher than the cost of riding a bicycle – that's the conclusion of a March 2015 meta-analysis. Coupled with the fact that most American highways are financial losers, we should be looking for alternatives to the personal automobile, especially for personal transportation. The authors of the study do acknowledge that the Danish approach does have limitations in that some aspects of a cost benefit analysis cannot put a financial cost to discomfort or the effects of injuries or death such as post-traumatic stress disorder or depression. But the authors do state that such a cost benefit analysis “can be a useful methodology to investigate advantages and disadvantages of bicycle projects, which are essential to foster bicycle cultures, i.e., lasting and significant changes in transport cultures.” Thus this approach can be important in making an economic justification in making investments to supporting and increasing cycling. All of this is part of Denmark's capital city to become world's best city for cyclists’ along with becoming a “leading ‘eco-metropolis’”. To briefly summarize, in his study (published as “Drivers overtaking bicyclists: Objective data on the effects of riding position, helmet use, vehicle type and apparent gender,” in the journal Accident Analysis and Prevention), Walker outfitted a bike with a device that measured the distance of passing cars. He found, among other things, that drivers tended to pass more closely when he was wearing a helmet than when not (he was struck by vehicles twice, both while wearing a helmet). This was a surprising, somewhat controversial finding that generated a lot of news coverage. To my mind, Walker’s findings were more interesting for what they said about interpersonal psychology on the road than safety itself; mostly because I felt, and Walker seems to agree, that the primary question of bicycle safety had less to do with the helmet than other factors. In a Florida DOT commissioned study [pdf] published last month, researchers reached a very similar conclusion. Although the study didn't specifically address helmet usage, the researchers found that their data was consistent with Walker's conclusions when it came to how closely drivers passed bicyclists based on the bicyclist's gender and attire. The study found that on average, drivers passed cyclists more closely when cyclists were dressed in "bicycle attire" and if the cyclist was male. 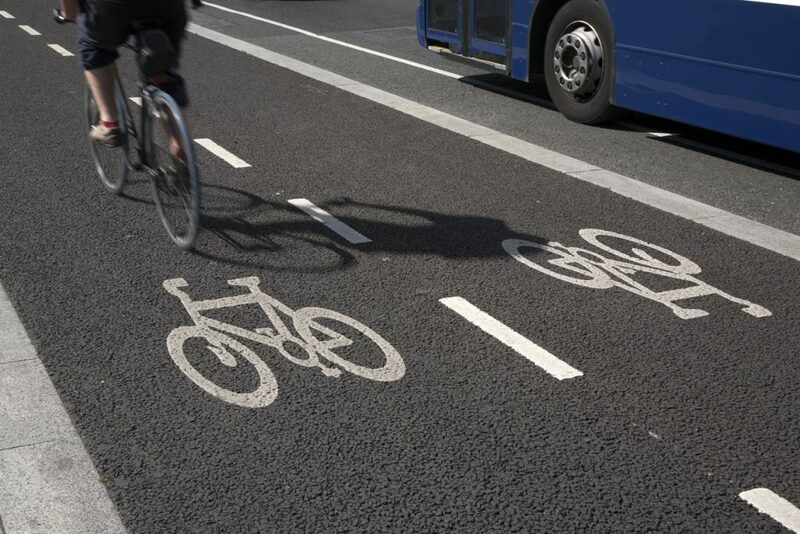 The study was unable to determine the reasons on this passing behavior and the authors of the study speculated that, "it [was] possible that motorists perceived less risk passing riders who were in [a] bicycle outfit." I suppose effective measures that can be made as a result of the Florida study would be to encourage cyclists to ride in casual clothing rather than bicycle-specific attire. As for the conclusion on passing distance based on the cyclist's gender, perhaps it is for the best given that men typically outnumber women on the roads.